A dual-lever car servicing lift, by Westinghouse. Homepage. This page: An idea to improve the productivity of mechanics and maximise use of space in the workshop. Westinghouse "two level" servicing system. The trade catalogue that this handy piece of equipment was on sale in dates to 1972, although the lift featured here could well have started out life in the 1960s, or before. It was produced by well-known garage equipment firm Westinghouse, whose products appear in a number of places across the site now. With the traditional style of two- or four-post lift, jobs that would usually be undertaken with the car on terra firma, for example fitting a new windscreen, or adjusting a door's fit, had to be done either before or after tasks that required the car to be in the air, for example fitting an exhaust. For a car requiring a thorough service or overhaul, this could easily double the number of hours it'd be taking up space in the workshop, time that couldn't necessarily be charged out to the customer. One solution to the problem of maximising the productivity of mechanics, requiring the minimum amount of space in which to do it, was this - the super-deluxe of four-poster lifts, called the Westinghouse "Hi-Line" Two-Level Servicing System. Incorporating a four-post lift, it benefited from having a high-level walkway built around the car, surrounded by barriers, accessible by a stairway. With such a gadget installed, mechanics could beaver away under the car, changing its oil, or making a few adjustments, while others could busy themselves with jobs under the bonnet, and in the cabin, without either party having to twiddle their thumbs while those up top, or down below, completed their work before being able to make a start themselves. For a busy workshop, such an installation could help productivity quite noticeably I'm sure. For jobs that required mechanics to be under the bonnet and under the car simultaneously, for example when fitting the front section of an exhaust to the manifold, a dual access lift like this was a big help. The "Hi-Line" was rated at 3.5 tons. The two side working areas measured 14ft long by 2ft wide each, while the rear walkway measured 13ft x 5ft. Optional extras that were available to the purchaser included four quick-release airline points, and a built-in lubrication system on the gallery level. No price is given for this item of equipment, but as a typical Westinghouse four-poster was listed at 441 GBP for the three-phase version, the Hi-Line two-level version would have been considerably more. 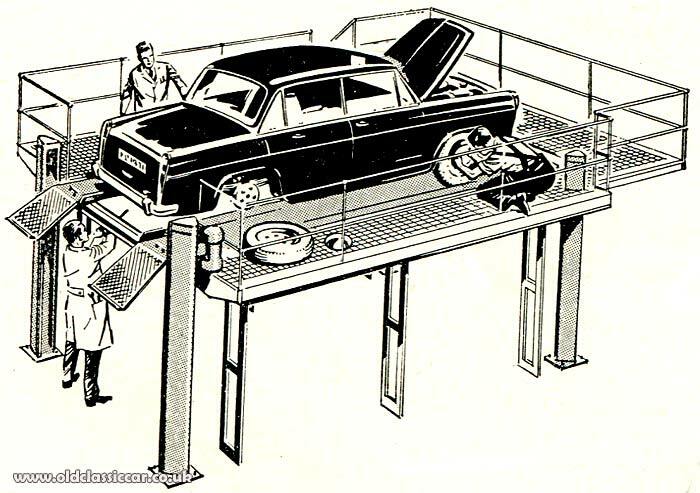 Return to the motoring gadgets, tools & accessories pages at oldclassiccar, where other tools including alternative types of car lift, are featured.